Passion For Promarkers challenge colours for this week are PRUSSIAN and PUMPKIN ... and they also want you to use the theme of 'Halloween'. I decided to combine it with this week's fab sketch over at Midnight Madness. The main image is one of the Gorjuss Girls from Sugar Nellie and I've coloured her with Promarkers. I've no idea who made the halloween stamps I used. They are all from a clear set I picked up somewhere, somewhen and are not labelled. Precious Halloween card. Love that black cat!! The Midnight Madness Design Team thanks you for playing with us this week. We will be looking for you next week too!! Love the colours used here, purple is one of my favs. Just done some Halloween stuff myself too. Small world eh? 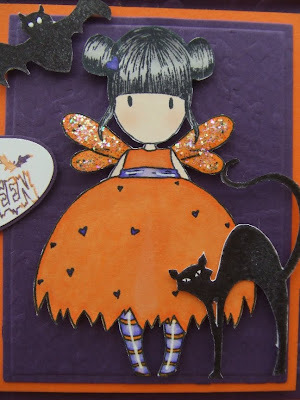 Fab Halloween card Teri, love your ribbon treatment! Fab card and the colouring is awesome. Wish I could do that myself. BTW the MS punches are at Craft Obsessions - next day delivery too! This is beautiful Teri!! Awesome Halloween card! Cute image!! Love all the textures and the color choice. Awesome take on the MMSC this week. Thanks for playing along!! Thanks for visiting my blog, been havung a look at some of your work and wow its gorgeous, beautiful cards and I love that little case you've altered. It's a stampin up one isn't it? Thats even more impressive!!!!!! It's totally gorgeous. Love the orange and purple! Fantastic card!! Thank you for playing with us this week and hope to see you again next week! 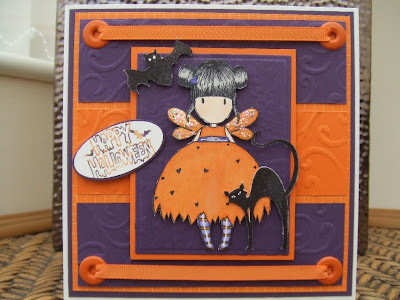 How inspired to take that gorjuss girl and turn her into a halloween image - fabulous- thanks so much for joining us at PFP and sharing your gorgeous card.